For Day With(out) Art 2017, Visual AIDS commissioned seven new and innovative short videos from artists Mykki Blanco, Cheryl Dunye & Ellen Spiro, Reina Gossett, Thomas Allen Harris, Kia LaBeija, Tiona Nekkia McClodden and Brontez Purnell. Curated by Erin Christovale and Vivian Crockett for Visual AIDS, the video program ALTERNATE ENDINGS, RADICAL BEGINNINGS prioritized Black narratives within the ongoing AIDS epidemic. Below, Uri McMillan responds to Mykki Blanco's video STONES AND WATER WEIGHT. Read Mykki Blanco's artist statement here. Stage kid, art school dropout, self-professed art freak, riot-girl, punk poet, indie rapper, cross-dresser poet extraordinaire: all of these audacious avatars adhere to and yet fail to fully capture the polyglot persona that is model-artist-performer-poet-rapper Mykki Blanco. Influenced and inspired by an eclectic mix of texts, artists, and pop culture fixations—including Patti Smith, Roselee Goldberg’s Performance Art: From Futurism to the Present, The Cosby Show, Vaginal Davis, Le Tigre, Laurie Anderson, and Michael Jackson—Blanco (née Michael David Quattlebaum Jr.) has seemingly always cut a particular and often unpredictable path in the downtown New York art scene and beyond, and eventually the milieus of indie rap and high fashion since his debut in 2012. Mercurial and mutant-like, part of his slipperiness has been his trenchant resistance to easy labels and evasion of facile interpretations of his category-defying, forward-thinking, and anti-institutional art praxis—not RuPaul but Edie Sedgwick; less a queer rapper, more Yoko Ono; not a painter but a poet. In this way, Quattlebaum’s various and often dizzying transmogrifications1 are less restless costume changes and more pointed attempts to avoid the over-determined readings of his identity as multi-gendered femme gay man at the expense of his brash messy performance art. The solemn poetic quietude of Blanco’s earth and pastel-toned STONES AND WATER WEIGHT (2017), commissioned for Visual AIDS’s 2017 Day With(out) Art program ALTERNATE ENDINGS, RADICAL BEGINNINGS, hints at still new possibilities in Blanco’s oeuvre, specifically his use of endurance-art based performance epistemologies to draw attention to the quandary of intimacy, physical strength, and resilience in a racialized HIV-positive embodiment. Strikingly, we hear before we see the protagonist. Filmed at a quarry in Norway, where Blanco was on an artist residency, the focal point of the image is a seemingly endless mass of stones as a barely perceptible distorted echo of Blanco’s looped voice seeps into the space and increases in volume. Dressed in a formal attire of a purple button-down shirt, forest-green blazer, billowy black slacks, and black galoshes, Blanco eventually steps down from the top of the screen carrying a woven basket, through which he begins taking out various tulle-like feminine accouterments—which happen to be props from his female persona. The disjuncture between the naturalistic setting, the plaintive affect of the frilly garments as they’re laid out on the stones (are they commemorating someone? ), and the disorienting vocoder-like vocal effects create a layered, haunting atmosphere. Blanco eventually picks up a large boulder, his body heaving with the effort, his eyes closed as in deep prayer, and holds it momentarily before letting it fall. He brings his hands to his face, breathes deeply, and then lets his arms fall to his side before opening his eyes and glancing upward, as a beatific smile slowly emerges on his face. We witness struggle and tension build in the body in this ritualistic staging as Blanco performs a testament to the resilience of the human body. Blanco has delineated the video as a “thought form”—or an attempt to access a unique state of consciousness—as well as a contemplation of his own embodiment. The water weight in the title is an allusion to the various weights carried in the body, water being the first to evacuate as a body becomes more and more athletic, and the resulting pressure for HIV-positive cultural workers like him to perform healthiness. The water weight also, of course, refers to perspiration, the effect of physical exertion, as muscles contract to hold objects, like heavy stones. Yet, it is the breath that I return to in this video, as we witness Blanco’s deep breathing, as he holds and lets go of the boulder. After all, it is the breath that reminds us of the endurance and precarity of the human body. It is the breath that prods us to remember our humanity and our sensuous connections to each other and the outside world. STONES AND WATER WEIGHT, then, strikes me as a meditation on being itself, on survival, and a radical commitment to both existing, breathing, while beckoning towards futurity, for imagining pathways out of an otherwise bleak and banal present, to reference the work of the late José Esteban Muñoz.2 After all, as Simone Browne notes, black creative acts are instrumental in evading forms of surveillance and enacting ecstatic flights to freedom.3 It suggests that black queerness itself is not simply an identity category, a debased subject position, but a fecund resource for minoritarian becoming, for imagining new possibilities of self and alternative worlds that resist incorporation into the state apparatus. Breathe, imagine, live. 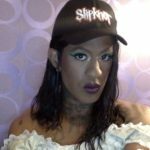 Most notably as “Mykki Blanco” transformed from an artistic idea and adolescent-like confessional video project inspired by Lil’ Kim and Nicki Minaj’s rap beef to a full-fledged charismatic celebrity and It Girl featured in FADER, W, and Interview magazines. Simone Browne, Dark Matters: On the Surveillance of Blackness (Durham, NC: Duke University Press, 2015). Uri McMillan is Associate Professor of Performance Studies in the Departments of English, African American Studies, and Gender Studies at the University of California, Los Angeles. He writes and teaches on aesthetics, performance, and critical theory. He is the author of Embodied Avatars: Genealogies of Black Feminist Art and Performance (NYU Press, 2015), the winner of three prizes, including the Barnard Hewitt Award for Outstanding Research in Theatre History and from the Errol Hill Award for Outstanding Scholarship in African-American Theater Studies, both from the American Society of Theater Research (ASTR), and the William Sanders Scarborough Prize for Outstanding Scholarly Study of Black American Literature/Culture from the Modern Language Association (MLA). He is the editor of “Surface Aesthetics: Art, Race, Performance and Play,” a special issue of Women and Performance: a journal of feminist theory (2018).